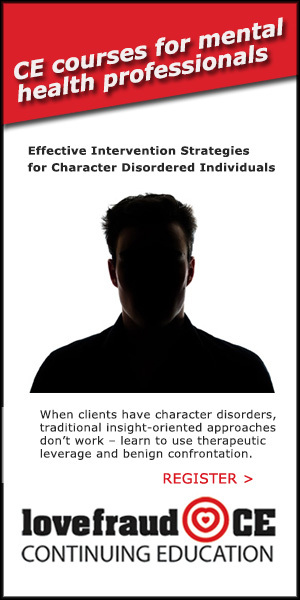 Therapists – When you were in training, did you learn about how people with personality disorders affect their partners? Probably not. 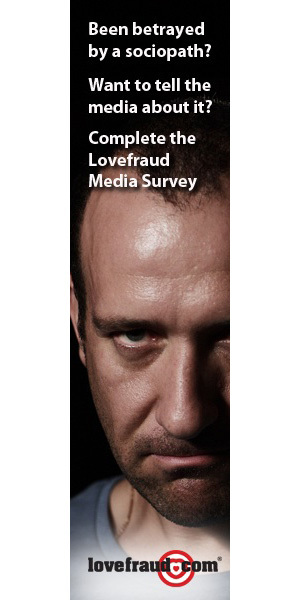 That’s why this Lovefraud CE course is so important. 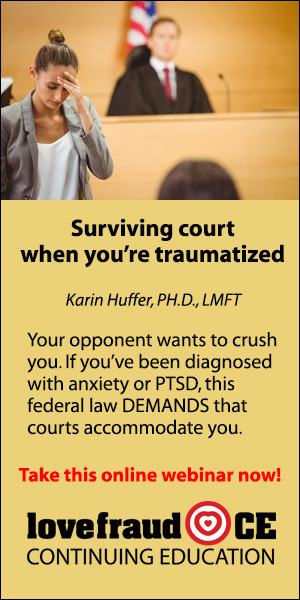 Mary Ann Glynn, LCSW, CHt, will fill in a big gap in your professional training. 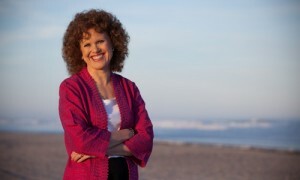 In this webinar, she’ll teach you how to recognize when a client’s distress is not his or her own anxiety or depression, but a normal reaction to a manipulative relationship. 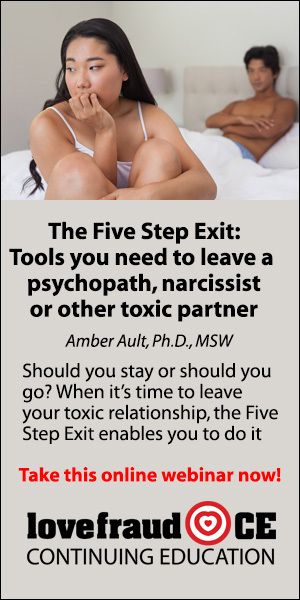 Part 1: Recognizing the exploitative relationship and its impact on the intimate partner Monday, June 5, 12-2 ET. 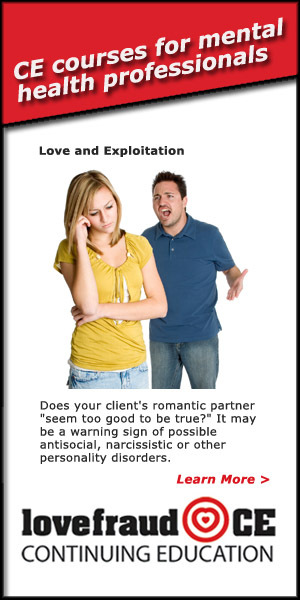 Part 2: Overview of therapeutic strategies for partners in relationships with exploiters Monday, June 12, 12-2 ET. 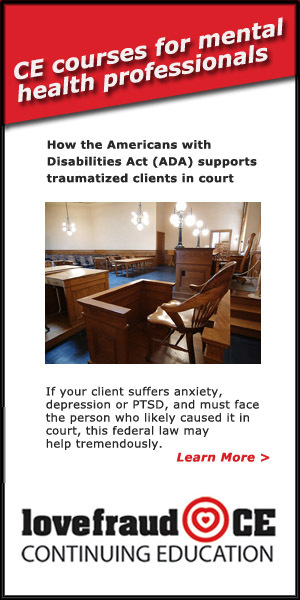 This is a Live Online webinar — you’ll be able to ask questions of the instructor. 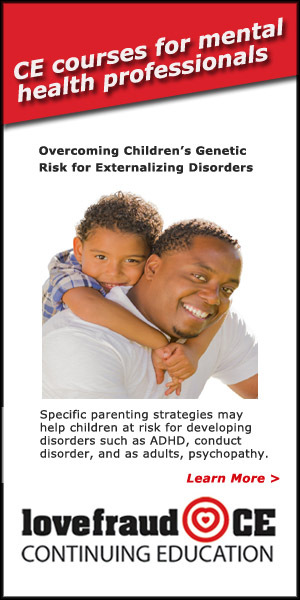 Psychologists and social workers may earn four continuing education credits upon completion of both parts. You are automatically enrolled in a private online forum, where you can interact with the instructor and other learners. 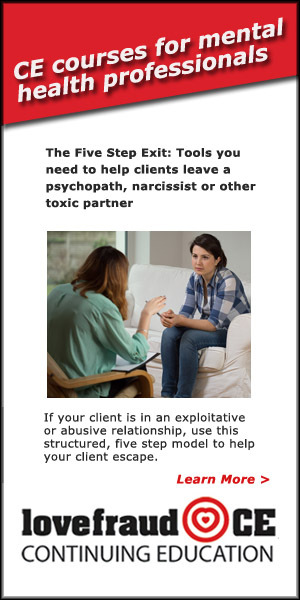 Therapists who earn 8 continuing education credits through Lovefraud CE are eligible for a free 12-month listing in the Lovefraud Professional Resources Guide. whymegod It depends on how resilient you are and how good a support system you have. I wish you the best. Hi Whymegod, sending you hugs!! I’m sorry that you were entangled in a abusive relationship. It’s not easy to leave this kind of relationship. So you should be so proud of yourself that you have escaped & found your way to this wonderful site that Donna Anderson created. She too was involved with a sociopath. YES, the heart ache DOES go away!! It takes time. You will go thru all of the grieving stages (google) just like a death. You will sob, cry, get angry, and some where along this journey you will let go of this evil guy emotional & find peace again in your heart & soul. 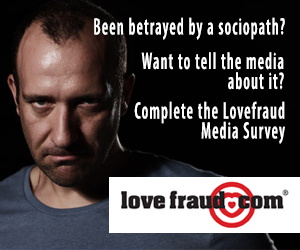 Keep reading & watching the videos up at the top of Lovefraud. 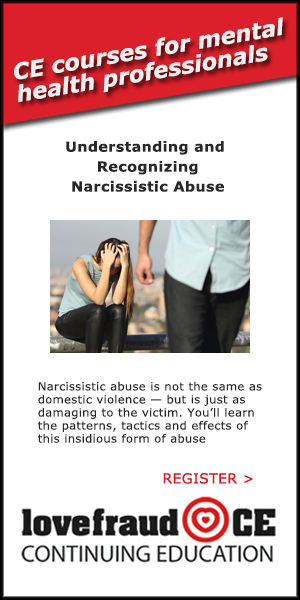 Find a good knowledge counselor who understands sociopathic abuse. 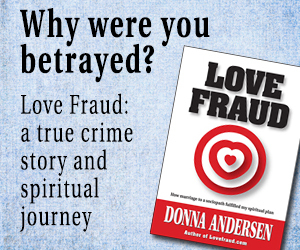 Read books like Donna Anderson’s Lovefraud (see also her book store at the top for more books). Come here & ask questions & vent.